Bowers & Wilkins, more commonly known as B&W, has been making quality speaker systems with unique—dare I say beautiful—designs since the 1960s. In other words, since before most iPod owners were born. Yet, like a handful of other audiophile companies bucking the anti-iPod audiophile trend, the company has recently embraced the iPod via the Zeppelin, a high-end, one-piece (“desktop”) speaker system. 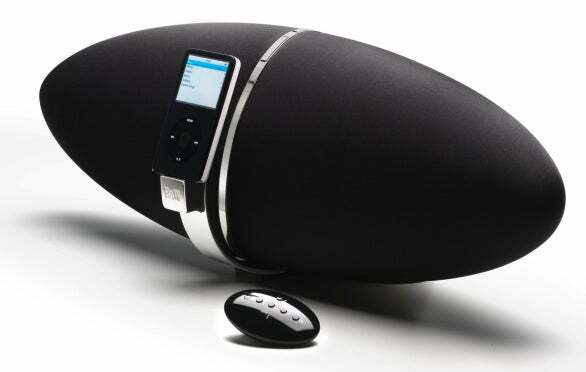 Like most iPod speaker systems on the market these days, the Zeppelin includes a cradle that hosts all dock-connector iPods, charging all but the 3rd-generation models; a remote control; an auxiliary-input audio jack; and composite- and S-video output jacks for viewing iPod-hosted video and photos on your TV. (The Zeppelin supports video-out with all video-capable iPods; it includes the necessary authorization chip for use with the third-generation iPod nano, the iPod classic and touch, and the iPhone.) The Zeppelin also sports a USB port, although not for syncing your iPod with your computer; the port is for installing software updates to the system itself. But three things, besides the $600 price tag, make the Zeppelin stand out from the crowd. The first is obvious: appearance. B&W has taken many of the design principles—aesthetic and audio—used in its home speakers and applied them to the Zeppelin. The obvious inspiration for the system’s name comes from its dirigible-shaped enclosure, approximately 25 inches wide—and that really is wide—by 7.5 inches high (with the included stand) by 8 inches deep. The front of the Zeppelin is covered in black, mesh fabric; the unit’s backside sports a chrome finish that mirrors (no pun intended) the shiny rear of an iPod. It’s a striking design, and one that inspires both positive and negative reactions; more of the former than the latter, if the Zeppelin’s time in my office was any indication. The Zeppelin’s built-in, rubber-foot base angles the system slightly upwards for placing the Zeppelin below ear level; an add-on stand, also rubber, lifts the back of the system slightly so the speakers radiate horizontally (the approach to take if the Zeppelin sits at ear level). At nearly 17 pounds, with no handle, the Zeppelin is less “transportable” than many desktop speakers we’ve tested—and the add-on stand tends to fall off if you pick up the system—but it’s not too difficult to carry from room to room. The Zeppelin also feels solid and well-built, and uses an internal power supply so there’s no “power brick” littering your space. Other unusual design aspects include the Zeppelin’s dock cradle. Instead of the traditional sunken, plastic cradle, B&W has mounted its iPod-docking connector on a chrome-plated arm that follows the curved front of the Zeppelin, leaving just under an inch of space between the arm and the Zeppelin’s body. Why the space? To make it easier to use your iPod’s own controls while docked: the ingenious design lets you wrap your hand behind the iPod as if you were holding it in your hand. The dock connector itself is mounted on a spring-loaded hinge; whichever iPod or iPhone you use with the Zeppelin, the connector tilts forward just enough to accommodate the player while keeping it pressed securely against a rubber bumper at the rear of the cradle. It’s a clever design that obviates the need for the plastic dock inserts used by most other speaker systems. On the other hand, the design also makes the arm look a bit like a carrying handle, but it’s not designed for such use; B&W explicitly warns that doing so may break the arm. The Zeppelin’s aesthetic design extends to its beautiful remote control, a pebble-shaped device with a glossy-black front and a chrome-plated back; a rubber foot in the middle of the back protects the chrome and keeps the remote from sliding around on smooth surfaces. Besides the standard Power, Play/Pause, Back, Forward, Volume Up, and Volume Down buttons, the remote also provides an Input button that toggles between iPod and auxiliary-input modes. The infrared remote’s performance and range are very good, and it feels great in your hand. On the other hand, the remote almost breaks my Cardinal Rule of Remotes by using a symmetrical shape with a symmetrical button layout, making it difficult to orient the remote by feel. The only tactile indications of orientation are that the Power button, on top, protrudes a bit, whereas the Input button, on the bottom, is flush with the surface of the remote. You can also turn the system on or off, toggle between inputs, and adjust the volume using chrome buttons on the top of the Zeppelin itself. B&W has also added a number of technical features that add to the Zeppelin’s uniqueness. For example, the auxiliary-input jack on the back handles both analog and digital signals; the Zeppelin includes a built-in digital-to-analog converter (DAC). This means you can connect the digital-audio output from a CD player, a computer, or even Apple’s AirPort Express Base Station directly to the Zeppelin via a mini-Toslink cable. Two other nice technical touches: On the same newer iPod models, the iPod’s screen shows the Zeppelin’s volume level using a display similar to the iPod’s own volume bar. This is a neat feature that provides a frame of reference for a particular volume level, despite the Zeppelin itself not having any sort of built-in volume display. And unlike most speaker systems, the Zeppelin gradually fades the volume back to its previous level whenever you resume playback—either by un-pausing the iPod or by turning the system on. Although not “Made for iPhone”—an official Apple designation indicating that a product won’t interfere with the iPhone’s wireless functionality and, perhaps more important for speaker systems, that the iPhone won’t cause audible GSM interference—I found the Zeppelin to be as iPhone-compatible as any other speaker system I’ve tested. Whether receiving a phone call or checking for email over an EDGE connection, I never heard any GSM interference. Finally, the third area in which the Zeppelin stands out is sound quality. In addition to taking many of the company’s home-speaker technologies and adapting them for the Zeppelin, B&W has stuffed a surprising amount of gear into a desktop package. The Zeppelin houses five speaker drivers: a 5-inch “subwoofer” in a ported enclosure; left and right 3.5-inch midrange drivers; and left and right 1-inch metal-dome tweeters. 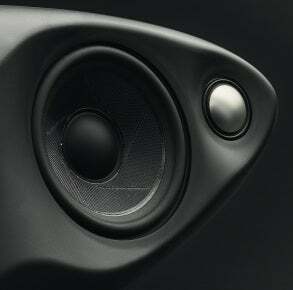 (B&W says the Zeppelin’s midrange and tweeter drivers are derived from the company’s M-1 speaker.) The Zeppelin’s shape actually serves a practical purpose here: the subwoofer is located in a large cavity in the thick center of the system; the tweeters are positioned at the narrow extremes; and the midrange drivers sit between the woofer and tweeters. Powering these five drivers are three amplifiers: a 50-Watt amp for the subwoofer and dual 25-Watt amps, one for the two left-channel drivers and one for the right-channel drivers. The Zeppelin’s other sonic flaws are inherent to one-piece speaker systems. On the one hand, the Zeppelin’s wide shape, which places the tweeters almost two feet apart, allows it to provide better stereo separation than most desktop speaker systems. However, the left and right speakers are still fairly close together, so you don’t get the kind of musical space and instrumental positioning you would get when listening to a system with speakers placed several feet (or more) apart; this is especially true, as with any one-piece system, when listening from across a room. But, again, that’s the tradeoff you make for a desktop system’s smaller size and lack of cables and wires. How does the Zeppelin compare to other higher-end iPod speaker systems? In terms of bass response and rich, room-filling sound, it’s among the best, out-performing several of our favorite desktop systems, such as JBL’s $300 Radial, Logitech’s $300 AudioStation, and Harman Kardon’s $350 Go + Play. On the other hand, if you’re a treble-lover, all three of those systems offer better high-frequency detail. And if you’re willing to put up with cables and buying a separate iPod dock, you can get better sound for less money from Audioengine’s $349 A5, which includes two excellent bookshelf speakers and a built-in amplifier; because you can position the speakers apart, the A5’s stereo separation and imaging are far better than is possible with any one-piece system. With a $600 price tag, the Zeppelin is among the most expensive iPod speaker systems we’ve seen; if sound quality is your primary—or only—consideration, there are less-expensive products that compete well. But while you’re surely paying for the B&W name and the Zeppelin’s design, you’re also paying for a very good speaker system with expensive materials and construction; impressive quality and attention to detail; a number of unique technical features; and excellent sound quality. In many ways, the Zeppelin reminds me of Apple’s own hardware, which often stands out for a compelling combination of design, performance, and overall quality. (In fact, the Zeppelin often made me wonder if this is what an “iPod Hi-Fi Pro” might be like.) Whether you’re willing to pay for an iPod speaker system that exhibits all these traits, rather than for a less-expensive product that offers a subset of them, is the question you’ll need to ask yourself.